I only recently realized that Brussels sprouts are actually the opposite of disgusting. On a whim, I tried them one day at work (where I'm spoiled beyond belief with free food), and my mind was blown. These were not your (or at least my) mother's Brussels sprouts. They were crisp on the outside, perfectly tender on the inside, and sweet instead of stinky. The trick? Roasting them. So when I saw these babies on Sunday morning at the Farmers' Market, I immediately grabbed half a pound to roast for lunch. My go-to lunch is always a big salad, so I served the straight-from-the-oven sprouts over a bowl of baby spinach along with quinoa (an amazing source of protein and other awesomeness), sun-dried tomatoes, and fresh lemon juice, which is a surprisingly sufficient stand-in for salad dressing. The combination of flavors was just right. Seriously, don't let bad childhood memories hold you back from these delicious, cruciferous gems, which are loaded with antioxidants and essential minerals. Preheat oven to 400 degrees. 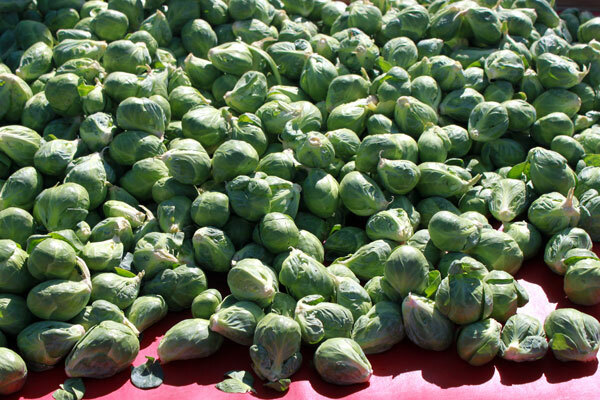 Trim and halve Brussels sprouts lengthwise, toss with olive oil, salt, and pepper, and place on a rimmed baking sheet. Roast for 30-35 minutes, turning once or twice, per Whole Food's instructions (adjusted for half a pound of sprouts). Meanwhile, prepare quinoa according to package instructions; I cooked half a cup and saved half for later, which took about 20 minutes. 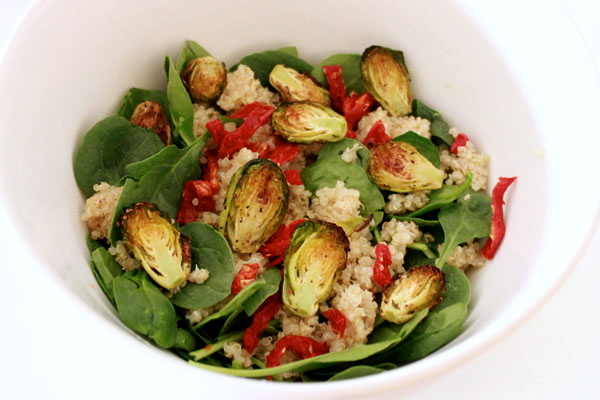 Dress spinach with the juice of half a lemon, then toss with quinoa, sun-dried tomatoes, and Brussels sprouts. 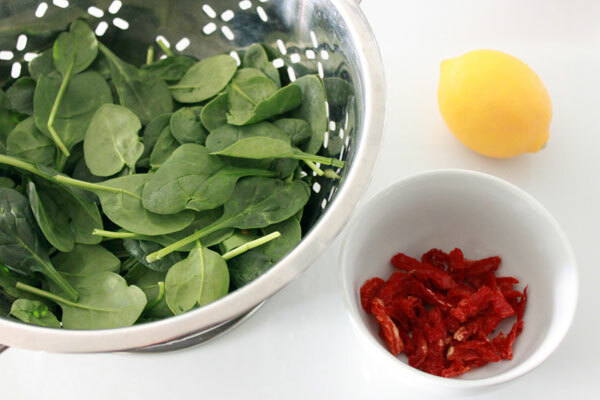 For an extra kick, add a shake of red pepper flakes and additional pepper to taste.